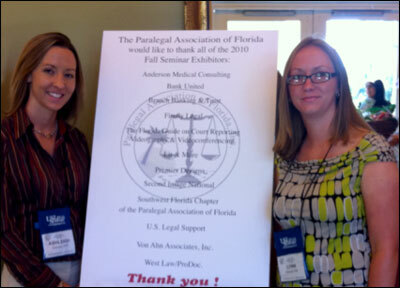 Lynn Parnell (on right) and Ashleigh Drexler (on left) attended the 2010 Fall Two Track Seminar on Saturday, October 16, 2010 in Bonita Springs, which was hosted by the Paralegal Association of Florida, Inc. This seminar is one of the many that they will attend to maintain their Florida Registered Paralegal certification offered by the Florida Bar. Currently there are only 3,914 Florida Registered Paralegal Members. A Florida Registered Paralegal must be registered under Rule 20 and demonstrate certain levels of education, work experience and/or national certification. Topics discussed at the 2010 Fall Two Track Seminar were The Paralegal’s Role in the Initial Client Interview, presented by Jody Shulman, Esquire, Ethics in the Judiciary, presented by Lawrence Pivacek, Esquire, Ethical Considerations for Transaction & Litigation Paralegals, presented by Frank A. Rodriguez, Forensic Photography & Evidence Documentation, presented by Robert Wyman, Legal Research & Citations, presented by Joshua Hajek, Esquire, and Effective Mediation Preparation Skills for Paralegals, presented by Jacqueline Buyze, Esquire.